The tale of an unhappy female ghost causing havoc for motorists on the highway is almost universal. There is one in the Czech Republic, but she is not the victim of a recent car crash like so many of the others. She was the bride at a 16th century wedding that ended in a massacre. 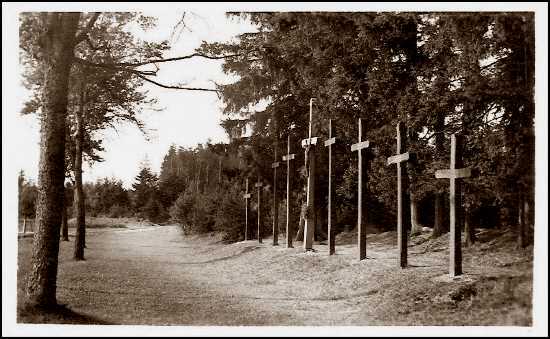 The place has been called Nine Crosses (Devět křížů) for as long as anyone can remember, and tall wooden crosses still stand by the side of the turnoff where the nine victims were buried. The site is a protected cultural monument. The spot is just off the D1 highway from Prague to Brno, the busiest road in the country. 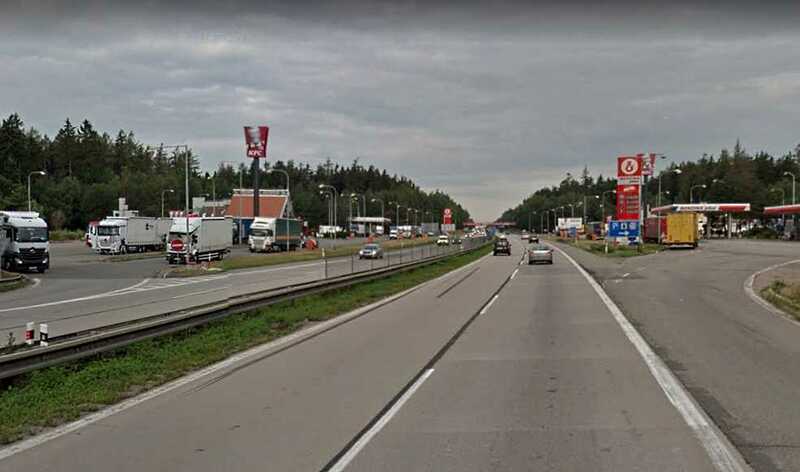 For years, tabloids have been pointing out that the fatal accident rate near exit 168 by the village of Lesní Hluboké, about 25 kilometers west of Brno, South Moravia, is higher than average. And perhaps the bride’s ghost is to blame. 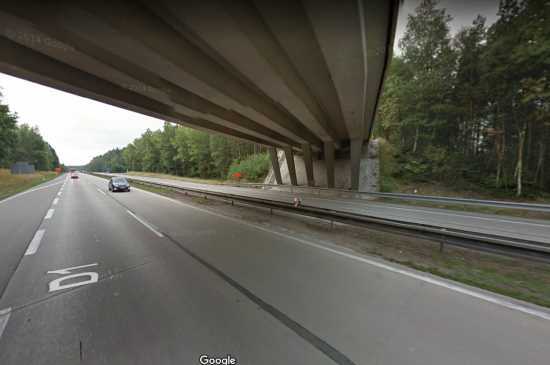 The area just under an overpass for Exit 168 is where the white-shrouded ghost is supposed to appear, frightening motorists into losing control of their cars. An old trade route for horse-drawn carts stood at the site long before Exit 168 was opened in 1973. The overpass at Exit 168 on highway D1. Source: Google Maps. The curse has been in place for almost five centuries, according to supporters of the tale. A wedding was planned in 1540 at the village of Lesní Hluboké, which means the Forest Deep. The town had existed since at least 1395, and likely is much older. The story starts a year earlier, in 1539. A peasant from Lesní Hluboké was returning from the market in the big town of Velká Bíteš, when he saw a wounded Hungarian horse merchant on the road. The peasant brought the merchant home, and healed his wounds. The peasant had a very beautiful daughter who helped to look after the wounded merchant. The two, being young, fell in love with each other. The girl’s father though, had different ideas. He wanted to marry his daughter to a wealthy person so the family could improve its standing. This was a time when marriages were often still arranged. Faded street sign at Devět křížů. Public Domain / Creative Commons. The father sent the merchant to Hungary to do some business deals, and if he returned wealthy after a year then he would consent to the wedding. This was just meant to get rid of the merchant. The father hoped he would have another accident and never return. Or fall in love at home like people are supposed to. Another version says that the merchant left on his own, having agreed with the daughter about a secret wedding on his return. But the tale soon takes a dark turn. The son of a rich local family became interested in the beautiful young woman, just as the father had originally hoped. The parents on both sides were in favor of the marriage, and the daughter was left out of the discussions. The girl’s father set aside any thought of the promise to the Hungarian merchant and forced his daughter into the arranged marriage. 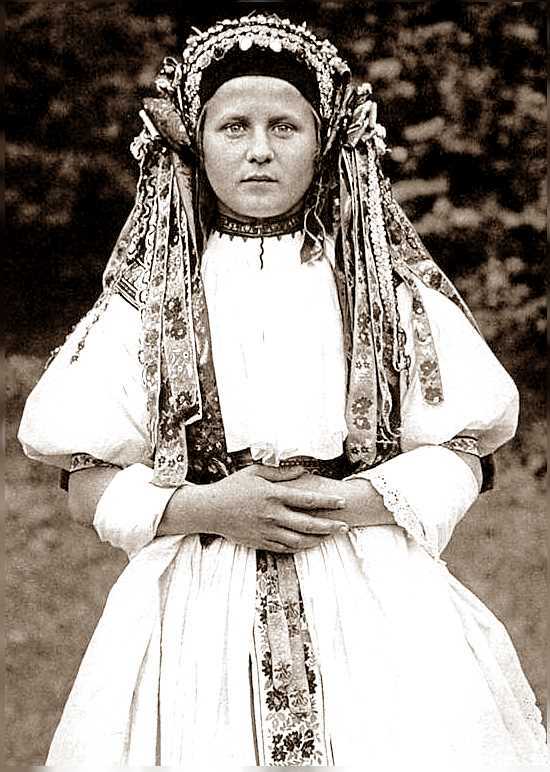 Traditional Slavic wedding dress. Public domain. Somehow word got to the merchant. Either the daughter managed to send a message or some other merchant from Domašov sent word out as part of a code of merchant courtesy. Perhaps he simply returned because the year was up. The Hungarian merchant was not happy at being jilted, and he wasted no time in planning his revenge. At a local inn he talked a friend, perhaps the local gamekeeper, into helping him punish the wedding party, but the bride was to be spared. They would ambush from secret, and not be seen. Perhaps he thought he could emerge as the hero, pretend to fight off the assailants and rescue his widowed loved one. Maybe he thought he would console the grieving widow and marry her after a brief mourning. Whatever his plan was, it went astray. 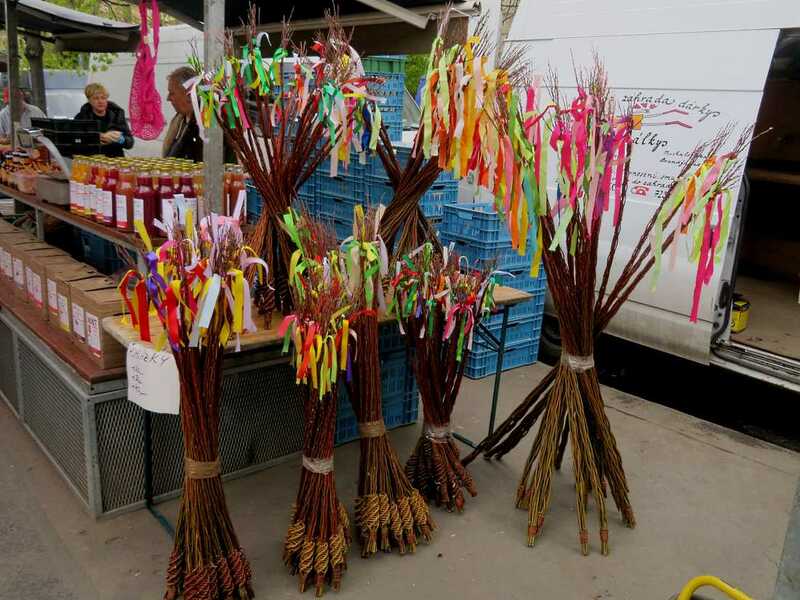 The happy wedding procession was returning from the church in Velké Bíteš to the village of Lesní Hluboké, without a clue that the merchant had returned and was laying in wait. Devět křížů in 1951, before the highway turnoff was built. Public domain. At the crossroads in front of the village, the merchant and the gamekeeper opened fire. There were seven killed on the scene. The dead included the bride and bridegroom, the bride’s father, the witness, and three other women, including bridesmaids. Guns were not very accurate then, and it was easy to hit the wrong target. When the merchant saw that his beloved was among the dead, he turned his anger against the gamekeeper, blaming him for the stray bullet. He shot the gamekeeper in anger, and either the gamekeeper lived long enough to shoot back or he took his own life, knowing there was no way out. The nine dead were buried at the spot. 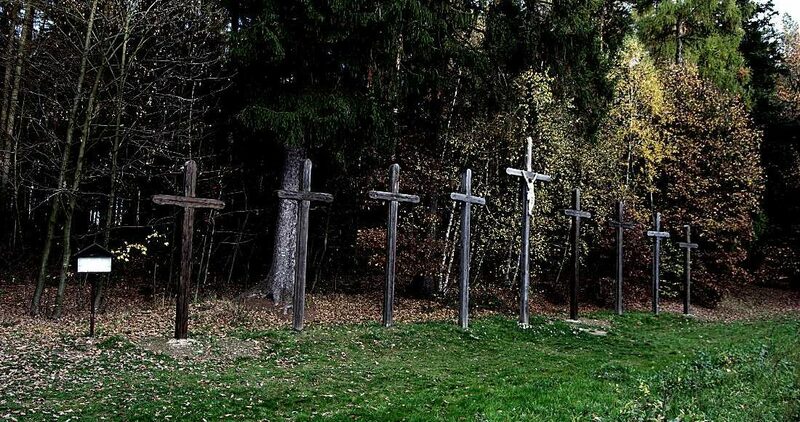 Crosses were put up by the Benedictine monks from the nearby monastery in Rajhrad, and for a long time they were reconsecrated every 100 years to pacify the souls of the nine dead. The last reconsecration was Sept. 18, 1887, meaning that since 1987 the souls have not been appeased. The wooden crosses have been replaced several times. 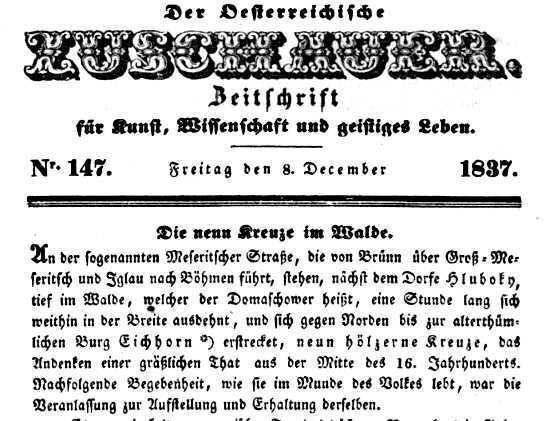 Account of “Die neun Kreuze” in an Austrian magazine from 1837. Tabloid newspaper accounts say the bride, dressed in white, now appears standing in the middle of the D1 highway by the exit 168 overpass, causing drivers to swerve. Other accounts talk of a pair of black wings that swoop down on windshields, causing the driver to panic. One writer for a mainstream newspaper even talks of the Domašov Triangle, an area that includes Nine Crosses, which has several unexplained road accidents. The Nine Crosses are a registered cultural monument, though the National Monument Office (NPÚ) gives the rather vague account that the wedding party was killed by impoverished rogue soldiers returning from a war in Turkey. In 2017, Karel Lupínek, the 74-year-old mayor of Lesní Hluboké, was quoted by tabloid Aha! 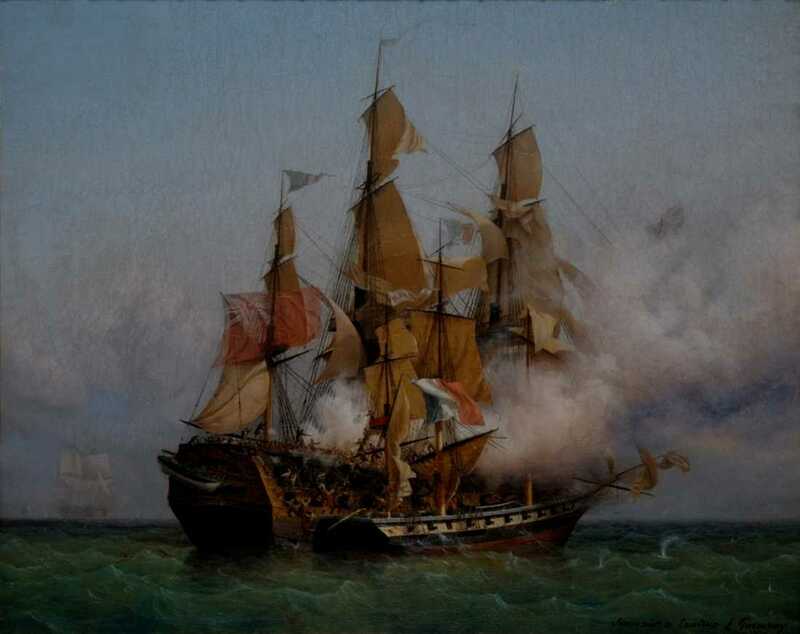 giving the revenge of the merchant tale as the official tradition. He admits that the original documents have been lost and the story has been handed down by word of mouth. Similar accounts have appeared over the years in the tabloid Extra Story, and in a blog in the mainstream newspaper Mladá fronta Dnes. Rest stop at Devět křížů on the D1 highway. Google Maps. A short program on the topic also airs on state-run Czech Television in a mystery series aimed at a young audience. The village of Lesní Hluboké today has about 250 people. A motel is nearby and a highway rest stop. In 2012, archaeologists from the group Archaia, together with scientists from Masaryk University, explored the site but did not find any human remains that could support this legend. They used ground-penetrating radar. The radar found remnants of previous wooden crosses but no human bones. According to then-mayor Vladimír Ryšánek, the bones were moved between 1965 and 1970 during the replacement of deteriorated crosses. Later the bones were placed near the middle cross, but were likely destroyed during frequent excavations for new utility pipes and cables. 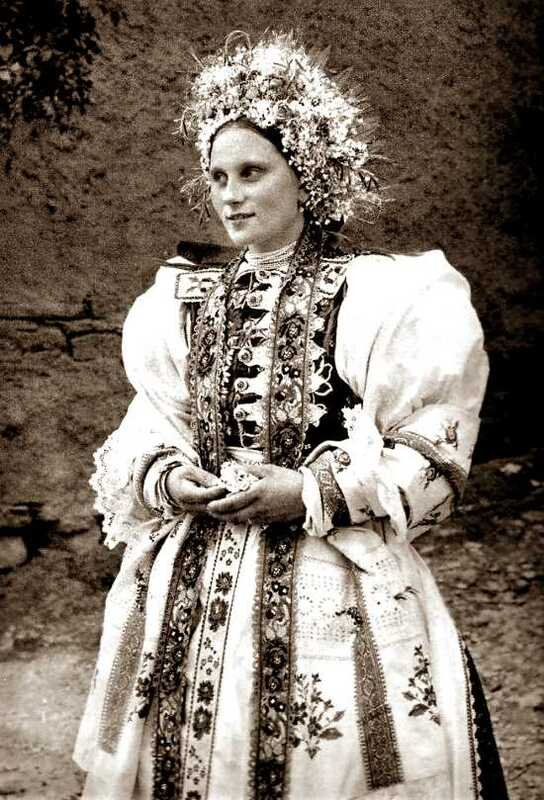 Woman in a Slovak wedding dress, which is similar to a Moravian one. Public domain. Ryšánek said the bones were stored in his family home basement and examined by archeologists at the time before being reburied. As this was the communist era, there was no religious ceremony. Archeologists say that even if bones were found it would not prove whether the wedding massacre was caused by rogue soldiers or by a jilted horse merchant. Or if the graves were simply from some other cause. The reason the crosses were not reconsecrated in 1987 was that the Benedictine monks were no longer at the Rajhrad monastery. They were evicted in 1950 and did not get the property back until 1990 in a poor state. A small community of monks did not return until 1997. The monastery was founded in 1045, and is the oldest of its type in the Moravia region. 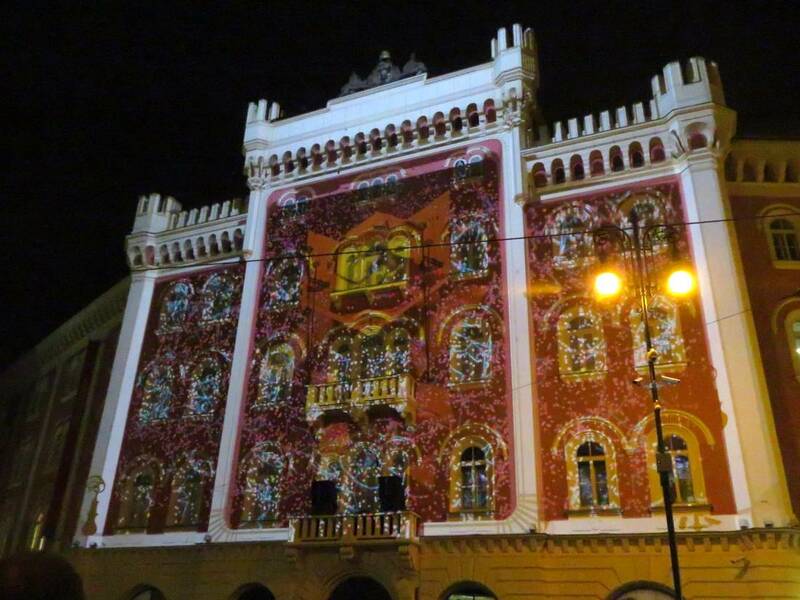 The current building complex was built between 1721 and 1746 according to the design of the architect Jan Blažej Santini-Aichel. 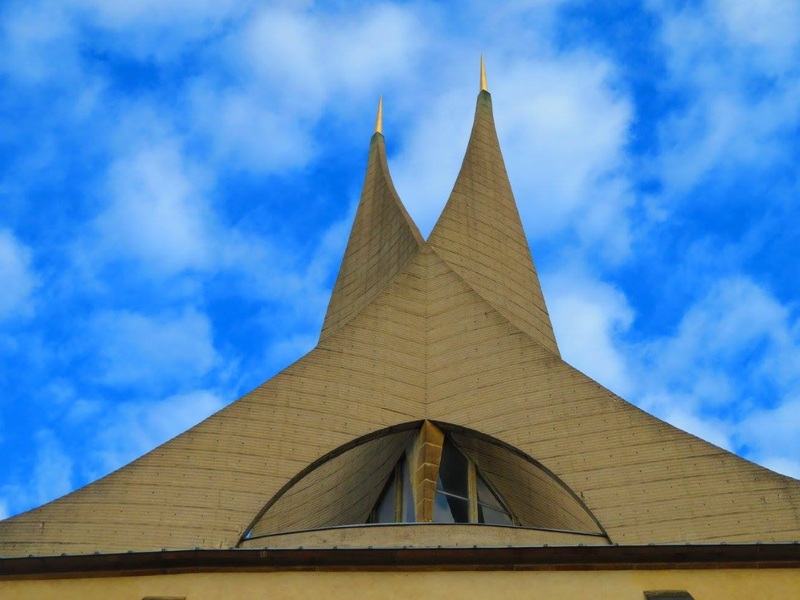 The town of Lesní Hluboké was first mentioned in 1395 when King Wenceslas IV granted rights to the Rajhrad monastery. The village was called Hluboká until the 1950s. The village was historically home to forest workers, bricklayers, carpenters and tradesmen. In the past, the D1 highway had been called the “road of death” since it had a high accident rate. Highway fatalities are down significantly in recent years on the D1 highway due to more modern warning signs that slow traffic in case of fog, a constant problem in some sections as the highway runs through some valleys and near natural waterways. Tougher enforcement of zero-tolerance drinking and driving laws have also been credited with lowering the accident rate. Fog and icy conditions on highway D1. Wikimedia Commons. The highway is also being improved with more modern surfacing and safety features, though the area at Nine Crosses is still one of the bumpiest according to a recent survey of the entire road. 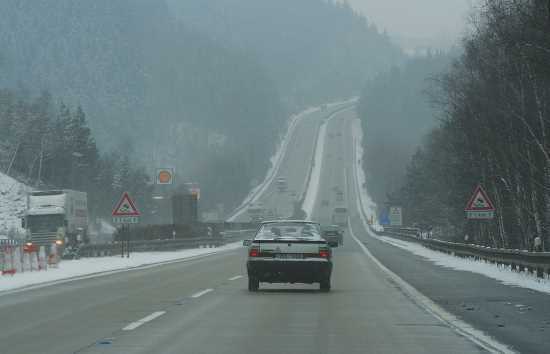 The Czech Republic as a whole has a high accident rate, some 15.7 deaths per billion vehicle kilometers, which is the highest in Europe and second only to South Korea out of 22 countries listed by International Road Traffic and Accident Database (IRTAD) in 2015. The country also had 6.2 deaths per 100,000 people, ranking it 23rd out of 32 countries surveyed by IRTAD. Main image: Devět křížů, Wikimedia Commons.